But Seriously Folks, I really do have the most amazing customers. Erin contacted me in September of 2018 asking if I could build her a custom uke for her live performances and for recording her upcoming third album. After a quick google I knew that she was a pretty special musician and was feeling very excited to work with her. Erin specializes in blues rock and lays down some pretty wicked licks on her guitar, but she’s also a uke girl and wanted to be able to incorporate some her blues riffs into her uke tunes. Enter Joyner Ukuleles. Erin had some special requests for her instrument. First, she told me she was dreaming of a uke with a whammy bar. She had seen the ukes I had built in the past, but wanted a tremolo unit that was a little more stout. In addition, Erin wanted to incorporate her logo into her instrument. In Erin’s logo, the E of her name is defined by the body of a guitar, so we decided to recreate this effect on her uke by doing an inlay all the way along the edge of the left side of her instrument. The Tremolo was a little more challenging. There is not a commercially available 4 string through body tremolo unit, so the only option was to design one from the ground up. 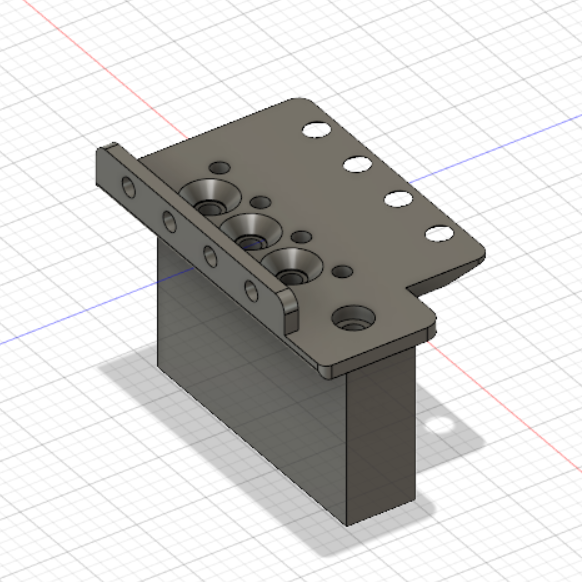 I started with a vintage fender bridge and modified the design to work with my string spacing and body width in my CAD software. Fender used solid steel on their bridges, so even though I own a CNC machine, I knew I would have to find a machine shop that was up to the challenge of manufacturing the bridge for us. I called around to several local shops before finding the right fit. Many of the shops are high volume and even though this felt like a big project to me, it was relatively tiny to them. Eventually I found Mike, who was able to squeeze my project in between his larger orders. His main business is working with the semi conductor industry, so he was eager to do something a little bit different and help me out with the bridges. In our first meeting we worked through the design and material options and I left feeling great about the shop and project. It took a couple of months to complete manufacturing and nickel plating, but before too long I had a nice heavy bridge, custom designed and manufactured for my Electric ukuleles. Once the bridge was completed, Erin’s uke could start in earnest. We selected a beautiful koa top with a matching headplate overlay, a walnut back, and maple neck with an ebony fret board. The build went super smooth and the custom “E” inlay came out beautifully, stunning in its own understated way. Before I knew it, Erin’s uke was in finish and ready for a setup. The moment of truth came when it was time to install the newly manufactured bridge. I installed it, stretched the springs to apply tension, screwed in the whammy bar and gave it a pull. Everything fit! It’s action was smooth, and I was reassured that the project was going to be a success. I anxiously finished the rest of the setup so I could hear this new uke for the first time. The sounds. Oh man. The sounds. It was incredibly exciting to play this uke for the first time. To press the whammy bar in and hear the strings change pitch. What an experience! But you don’t want to hear about me playing it. This is all about Erin. 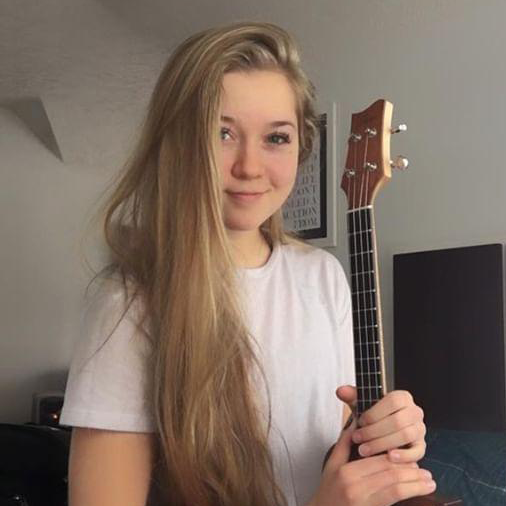 When I emailed Erin to let her know her uke was finished she asked if I could ship it directly to the recording studio where she was getting ready to record her 3rd album. It made it just in time. Erin did a live reveal of her new uke on facebook from the studio and played one of her original tunes on it and I’ve got to say, it sounded a lot better in her hands than mine. 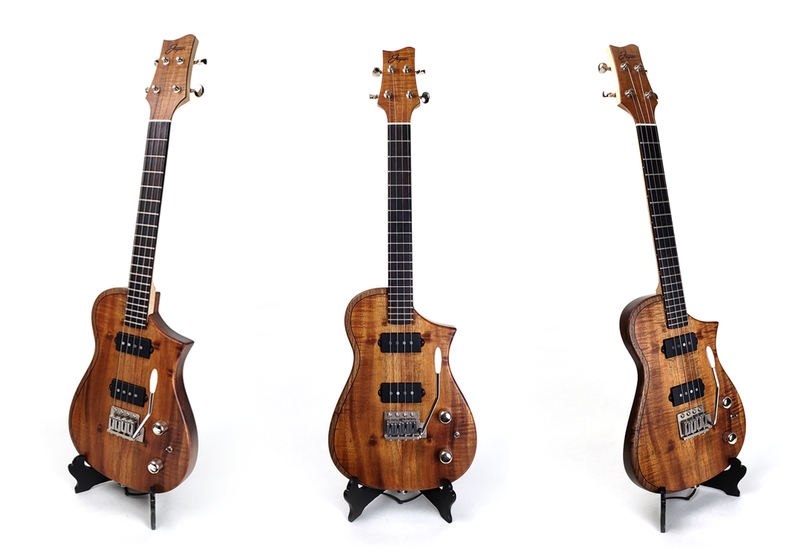 This uke was an incredible project. It took engineering, creativity, problem solving, and a lot of patience, but it is one of the best instruments I’ve ever built and I’ve got Erin to thank for that. I’m so glad to have connected with Erin on this project and I can’t think of a better musician to own this amazing uke. Be sure to check Erin out at ErinCoburnMusic.com and see more pictures of her uke in our Showroom.